Street corn, or grilled Mexican style corn, aka Elotes, first became popular through street vendors selling fresh corn brushed with a variety of flavors in Mexico. The most traditional highlights the sweetness of the corn while maintaining the crunchiness, typically with a creamy chile-lime sauce. 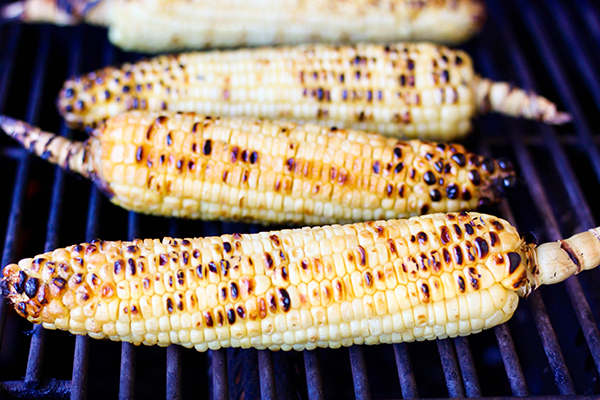 The trick to replicate that sweet, crunchiness is to grill the corn. Delicious as a side or a snack, there are limitless options to taking your everyday sweet corn and turning it into a masterpiece. Here’s one variety that’s pretty authentic and only slightly more effort than butter and salt. 1. Prepare a grill, with heat medium-high and rack about 4 inches from the fire. Put corn on grill and cook until kernels begin to char, about 5 minutes, then turn. Continue cooking and turning until all sides are slightly blackened. 2. Mix together mayonnaise, lime juice, chili powder, and some salt and pepper in a small bowl. Taste and adjust seasoning, adding more lime juice or chili powder if you like. Serve corn with chili-lime mayo. For a spicier variety with bits of cheese, try the Serious Eats version.